Pocket Systems launched PocketKey, a new system designed to permanently end the problem of e-commerce credit card theft for consumers, merchants and banks. 85% of Americans in wealthier households now consider card theft from a merchant as their biggest crime risk and 27% of Americans have experienced the anxiety and hassle of card theft in the past year. By 2018, losses to banks and merchants from credit card fraud are projected to reach $19billion. PocketKey is a small, lightweight digital device that enables true end-to-end encryption for e-commerce (card not present) payments. The device eliminates the possibility of fraud by encrypting payments before they enter your computer or smartphone, and keeping them encrypted as they pass through merchants, gateways and card networks, until they reach the card issuing bank. The core problem with credit and debit cards is that the standard 16-digit number can easily be compromised, copied or even guessed – and subsequently used by thieves. PocketKey replaces the 16-digit number with a one-time use 75-digit number and encodes information specific to the transaction within the payment itself. Even if the payment number is stolen, it will be completely worthless to thieves because it is bound to a single merchant and unique transaction or customer account. For online payments, the device plugs into a computer through a USB port or into a mobile device through the headphone jack. Despite the deep technology at the heart of PocketKey, using the device will actually speed up online and mobile transactions for the consumer. Online payments that can sometimes take minutes of tedious typing would only require a few seconds and one button click with PocketKey. When you plug in the device, it will enter your encrypted payment automatically and securely auto-fill every required field for billing and shipping. 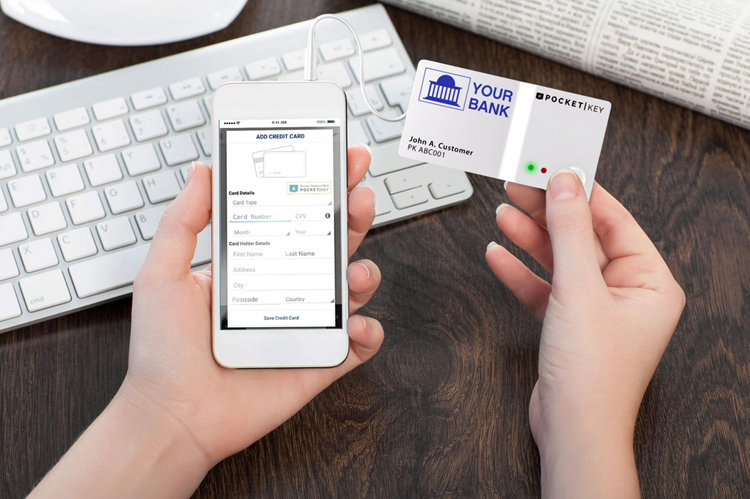 PocketKey technology is compatible with existing card processing gateways and card networks. The payment data from PocketKey looks exactly like the data generated by a magnetic swipe card and can therefore travel through payment gateways in precisely the same way. Merchants can also easily adopt PocketKey with free support from Pocket Systems and can choose payment types including one-time payments, card on file authorization, subscription payments, instalment payments and partial payments.